Soothes burns, sunburns, rashes, insect bites and chapped or dry skin, muscle and bone repair. 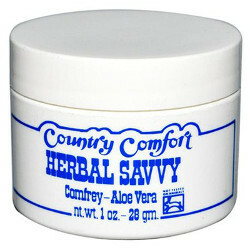 Ingredients: St. Johns Wort, calendula, aloe vera, beeswax, Vitamin E, comfrey. Each container is 1 ounce.